Poor. History-Military and War. Ex-Library Book, most cover in poor condition. Inside hinge split. The fi rst full account of Hitlers Intelligence machine, with never before release d photos, secret files and personal reports of Nazi officers and agents. Very Good. The first full account of Hitler's extensive intelligence network-and the dramatic story of how Germany lost the battle of the secret services in World War II. Trade paperback (US). Glued binding. 718 p. Contains: Illustrations, black & white. Good. 0025606107 Ships promptly from Texas. Fair. 0025606107 Ships from Tennessee, usually the same or next day. Intelligence, Espionage, Reconnaissance & Electronic Warfare Very Poor quality, ex library copy, well used. Rubbed covers, marks on pages. Study copy. 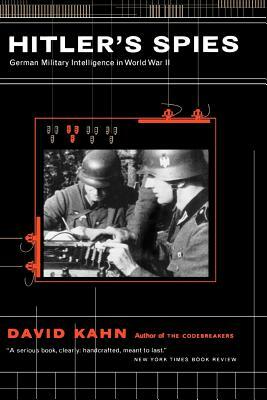 German Military Intelligence in the Second World War. Includes a detailed account of how German intelligence handled three major aspects of the war viz. the invasion of Russia, the landings in North Africa, and the D-Day assaults. There are 50 photographs including those of reconnaissance diagrams and also previously unseen documents. In the text are various maps and sketches. UL-XXXXXX. xiv + 671pp, 51 illustrations, notes, bibliography, index. Excellent book but the reader should exercise care. The Author goes sometimes into too much details. While they may be useful for the serious researcher the casual reader should learn to skip them, because for even the semi-professional they slow down the flow and may overload the read. But as stated: This book is for the whole public so others will like this feature.